Was there a Privacy Violation!? This message said: I think I got a text from you June 30. – I do not see a record of an outbound message to you. – June 30 was a long time ago. – Last night was Saturday and it was very late. 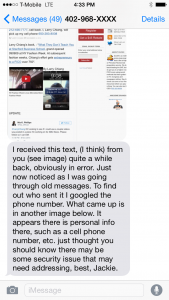 I received this text, (I think) from you (see image) quite a while back, obviously in error. Just now noticed as I was going through old messages. To find out who sent it I googled the phone number. What came up is in another image below. It appears there is personal info there, such as a cell phone number, etc. just thought you should know there may be some security issue that may need addressing, best, Jackie.